2019 might be the year that revenue from streaming services finally eclipses the total brought in by the box office. With major new player Disney+ set to offer the first real challenge to entrenched services like Netflix, Hulu, and Amazon Prime — and upstarts like YouTube Premium, CBS All Access, and Apple TV+ all trying to horn in on their pieces of the market — it's truly a boom time for having access to quality entertainment in the comfort of your own home. It's a brave new world, to be sure… but don't start playing the funeral march for your local multiplex just yet. Despite the encroachment of what seems like dozens of streamers on its territory, Hollywood had its biggest year ever in 2018, nearly breaching the $12 billion dollar mark domestically and raking in an eye-popping $41.7 billion globally. It turns out that the secret to getting butts in seats isn't so secret after all; you just need to make really good movies, and last year, Tinseltown fielded a heck of a lot of those. With the dominant superhero and horror genres having another exceptionally strong year, those box office records might not stand for long, thanks to flicks like these — the best films of 2019. An updated, family-friendly take on the King Arthur legend, The Kid Who Would Be King had a lot going for it right out of the gate. It's the second directorial effort from Joe Cornish, who helmed the excellent (and very, very British) sci-fi comedy Attack the Block, and who collaborated on the original script for Marvel's Ant-Man with Edgar Wright. The flick's casting is pure genius, with Sir Patrick Stewart as the wizard Merlin and Rebecca Ferguson (of the Mission: Impossible series) as the evil enchantress Morgana. In the lead is young Louis Ashborne Serkis, whose father Andy is a performer of some note. The story of a British schoolboy who stumbles upon the mythical Excalibur and must embrace his identity as a leader, The Kid Who Would Be King was a significant money-loser for studio Fox — but it scored with critics, which should give it a strong enough home video showing to lessen that sting. Reviewers found it to be "sentimental in all the right places, and impossible to dislike" (you know, like the British), with Cornish delivering a "sword-and-sorcery adventure with the intelligence and sensitivity that kids' films deserve, but do not always receive." Here's hoping its box office stumble doesn't dim the prospects of Cornish, who has talent to spare and has proven to be skilled at juggling comedic and dramatic elements in service of his unique visions. 2014's The Lego Movie was not only a surprise hit, but was one of the very best animated films of that year — far better, really, than any movie based on a line of building-block toys had any right to be. It cleaned up at the box office, made hot properties out of writer/directors Phil Lord and Christopher Miller (who just took home on Oscar for producing last year's Spider-Man: Into the Spider-Verse), and, well, was absolutely delightful. This year's cleverly-titled The Lego Movie 2: The Second Part saw the return of the first flick's stellar voice cast (including Chris Pratt, Elizabeth Banks, Alison Brie, Will Ferrell and Will Arnett) and added such talent as Tiffany Haddish and Jason Momoa (reprising his role as Aquaman from last year's live-action blockbuster). "While it takes a few beats to rediscover the manic rhythm of the original… about half an hour in, every piece more or less clicks," wrote The Globe and Mail's Barry Hertz, "and I will not apologize for that sentence." Reviewers had praise for the film's "surprisingly sophisticated" storytelling, and while many of the positive notices lamented that it wasn't quite as good as the original, more than a few begged to differ. Said Film Inquiry's Maria Latilla, "It's a rare film; a perfectly crafted sequel that expands on the world and mythology of its predecessor, but stands firmly on its own little Lego-legs." It's nice to know that, at least in Legoland, everything is still awesome. WWE Studios isn't exactly known for generating critically-acclaimed box office hits, being mostly producers of straight-to-video action vehicles for its wrestling stars (and, for some reason, the underrated 2014 horror flick Oculus). But the studio found gold in its fictionalized treatment of the 2012 documentary The Wrestlers: Fighting With My Family, which focused on the rise of WWE superstar Saraya "Paige" Knight. Helmed by reliable comedy director Stephen Merchant (co-creator of The Office and co-star of Hot Fuzz) and featuring an eye-opening turn from Florence Pugh (Lady Macbeth) as Paige, the flick didn't exactly blow up the box office — but critics found it to be engaging, heartfelt, and funny, and a worthwhile watch even for those not particularly interested in the world of pro wrestling. In fact, this was a common refrain among reviewers, from Devesh Sharma of Filmfare ("Watch it even if you aren't a fan of pro wrestling") to The Film Pie's Matthew Toomey ("You could know next-to-nothing about wrestling and still be enthralled by this eclectic group of characters") to Bob Chipman of Geek.com ("It's a hard movie to dislike, and I suspect it'll find more than a few fans who never thought they'd like a 'wrestling movie'"). But the most common was praise for Pugh, as characterized by The Detroit News' Adam Graham: "It's rising star Pugh who hits her finisher… she sells this tale even as it gets caught up in WWE mythmaking. Someone give her a title shot." Dreamworks' How to Train Your Dragon franchise has garnered the kind of critical praise — not to mention box office receipts — normally reserved for Pixar's offerings, and with good reason. Technically accomplished and imbued with a depth of storytelling and emotion uncommon for kids' animated features, the 2010 original and 2014's How to Train Your Dragon 2 raked in over a billion dollars at the worldwide box office and settled comfortably into the hearts of families everywhere. It took five long years for trilogy capper The Hidden World to finally arrive, and surprise — it was very, very good. Praise for the ever-evolving animation and stellar voice cast (which includes Jay Baruchel, Cate Blanchett, Craig Ferguson, and the great F. Murray Abraham) abounded; on his Mad About Movies podcast, Kent Garrison brought out the big guns, calling the flick "a touching and fitting end to one of the very best animated franchises in film history." Said Laramie Movie Scope's Robert Roten, "There aren't too many feature length animated trilogies, perhaps none as good as this one… [It's a] nice story, combined with marvelous animation, which has only gotten more sophisticated and effective over the years." But among the legion of critics marveling at Dreamworks' sticking the landing on their animated trifecta, none were so succinct as Johnny Oleksinski of the New York Post. "The movie," he said, "could easily be called How To End Your Trilogy." At this point, one could be forgiven for simply expecting to find the latest Marvel releases on lists such as these, but Captain Marvel had its work cut out for it. An origin story for a character that had yet to be introduced in the MCU, the film — the first big-budget tentpole for indie filmmakers Anna Boden and Ryan Fleck — had to give us a compelling story of its own while setting up the wildly anticipated Avengers: Endgame, and — thanks to an efficient script from Boden, Fleck, and Geneva Robertson-Dworet (Tomb Raider) and a winning lead performance from Oscar winner Brie Larson — it largely succeeded. The flick's message of female empowerment was not lost on critics, though it wasn't the only reason Larson was roundly commended for bringing a strong sense of pure fun and a healthy amount of swagger to her role. The effortless chemistry between Larson and Samuel L. Jackson as a digitally de-aged, two-eyed Nick Fury was also consistently singled out for praise, as was the performance of Ben Mendelsohn as the Skrull warrior Talos. But those observers most familiar with the MCU tended to be the most impressed, for a simple reason. 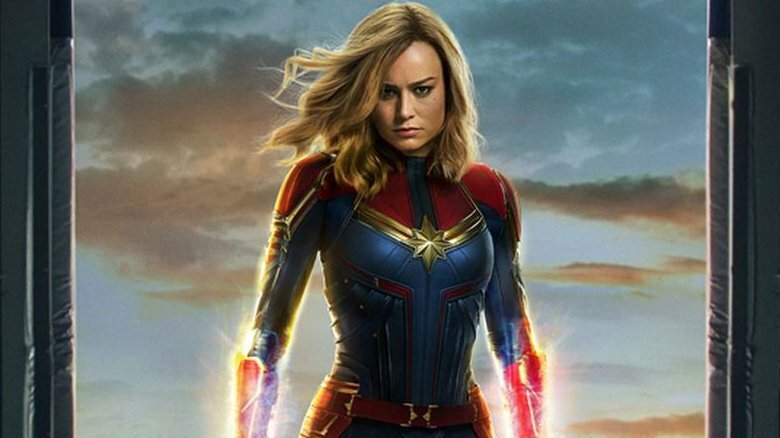 Said Allen Adams of The Maine Edge, "Captain Marvel could have floundered under the storytelling load it was asked to shoulder, but instead manages to (mostly) soar… With outstanding performances by Larson and Jackson, some clever jokes and a handful of good action sequences (both large-scale and small), it's a worthy choice as Phase 3's penultimate offering." It's an odd bit of serendipity that the first big-screen appearance of DC Comics hero Shazam — once known as Captain Marvel, until the rights to that name changed hands — happened to show up less than a month after the MCU's Captain Marvel, but if there's a competition going on there, it's a friendly one. In fact, Shazam! could be described as one of the friendliest superhero flicks ever, as star Zachary Levi completely sells the notion of a 14-year-old (played in his mortal form by young Asher Angel) inhabiting a superhero's body, bringing all of the wide-eyed wonderment to his role that that conceit would suggest. Shazam! is the first straight comedy for the formerly grim and dour Worlds of DC, and constitutes strong evidence that studio Warner Bros.' commitment to course-correction away from that vibe is not only very real, but it's working. The Wall Street Journal's Joe Morgenstern nailed down this notion pretty hard in his assessment. "What Shazam! lacks most obviously is gravitas," he said. "And grimness. Also bleakness, darkness and relentless self-seriousness. In other words, it's terrific fun." Much praise was heaped upon the performances of Levi and his young co-stars, with many also noting that director David F. Sandberg (Annabelle: Creation) proved himself adept at juggling the film's humorous, emotional, and action-packed elements. Most were simply excited for what the film means for DC moving forward, with Salon's Matthew Rozsa calling it "a sign that it is at last ready to compete with Marvel." If there were any concerns that writer/director Jordan Peele's Academy Award-winning debut feature Get Out would prove to be some kind of fluke, they were put resoundingly to rest by Us. Featuring what some are already deeming an Oscar-worthy performance by Lupita Nyong'o, the story of a family plagued by their own evil doppelgängers during a terrifying night at their beach house was immediately hailed as a "very significant horror film," one that is "freaky, scary, carefully crafted and deeply unsettling," and which "[opens] up subterranean levels in the psyche and [lets] the creatures within come out to play." Even reviewers more reserved in their praise for the film as a whole were stunned by the performance of Nyong'o. Said The Lamplight Review's Brent Hankins, "Performances in genre pieces are often dismissed and disregarded, but make no mistake: Nyongo's work in Us is some of the very best of her career." Remember, the woman took home an Oscar for her supporting role in 12 Years a Slave. The rest of the cast, including Black Panther's Winston Duke and The Handmaid's Tale's Elisabeth Moss, were also effusively praised, as was Peele's deft mixing of comedic elements with nerve-jangling terror. Stephen Silver at Splice Today perhaps summed it up the best: "Us combines masterful visuals with dense storytelling, and a half-dozen instant-classic sequences. And," he was sure to add, "it's scary as hell."